Did we make a steam engine or a pretty pile of scrap? Time to find out. In the previous installments in this series, we built most of the major pieces of our little wobbler steam engine. We just have a couple of accessory parts to make, and then we’ll be ready for fitting things together. 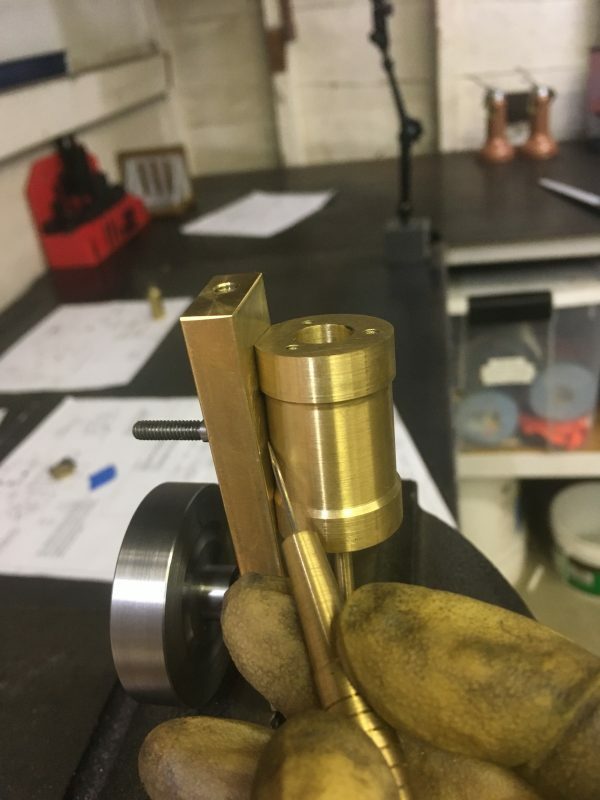 The second-last part we need is the tension adjustment knob for the cylinder pivot. This allows us to achieve a balance between steam-seal at frame/cylinder, and still allowing smooth movement. As is tradition, let’s take a look at the drawing first. 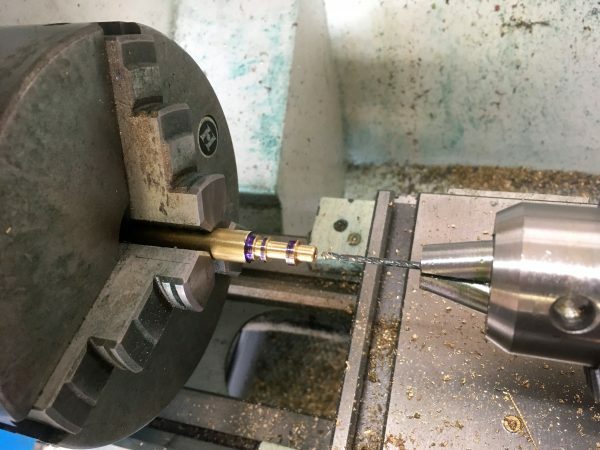 This is a very simple part to make on the lathe, although it does have one exciting element- knurling! The turning portion of this job is very straightforward. It’s just two diameters and a simple shoulder. Drill and tap the center as shown in the drawings. The last step we want to do is knurl the outer diameter. 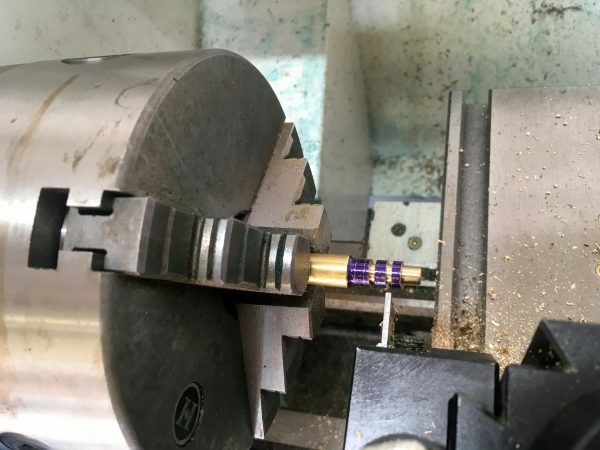 Knurling is a machining technique to create a 3D pattern on a surface so that human meat sticks can grasp it easily. A special knurling tool is used, which generally consists of a pair of wheels, each with half the pattern on them. You apply pressure to the stock with these wheels, and they form the pattern as the stock turns between them. Knurling is a forming operation, not a cutting operation, which means it requires a lot of force. Cutting knurlers do exist, but they’re hard to find and expensive. 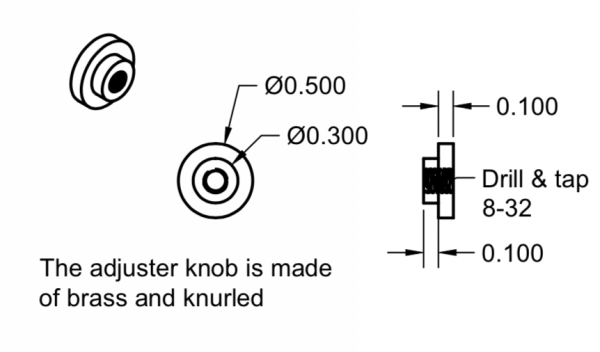 Get the outer diameter right for your knurling tool. Hardly anyone mentions this in online knurling tutorials, but it’s critical. 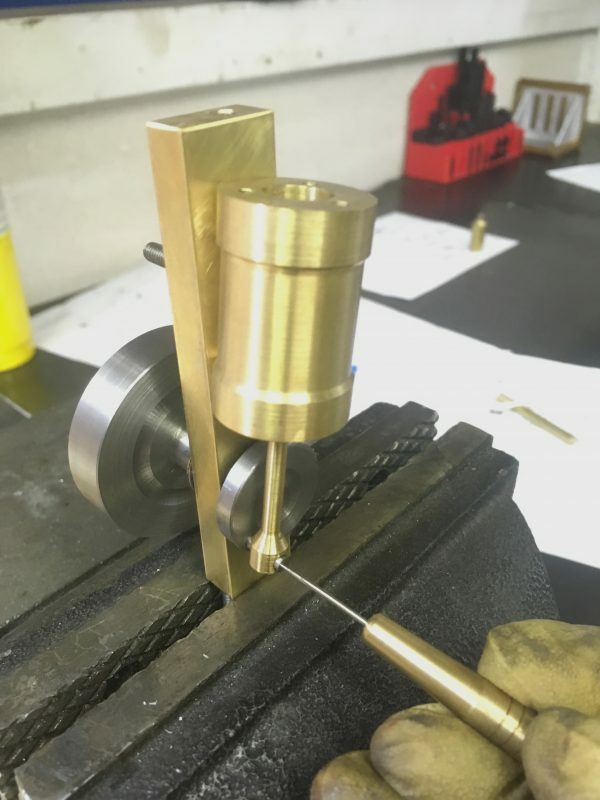 LittleMachineShop has a terrific online knurling calculator that I refer to often. You need to know the pitch of your knurler in points-per-inch. If you’re unsure, roll one of the wheels on a piece of paper, and count the peaks in one inch. It’s probably 21, which is by far the most common. 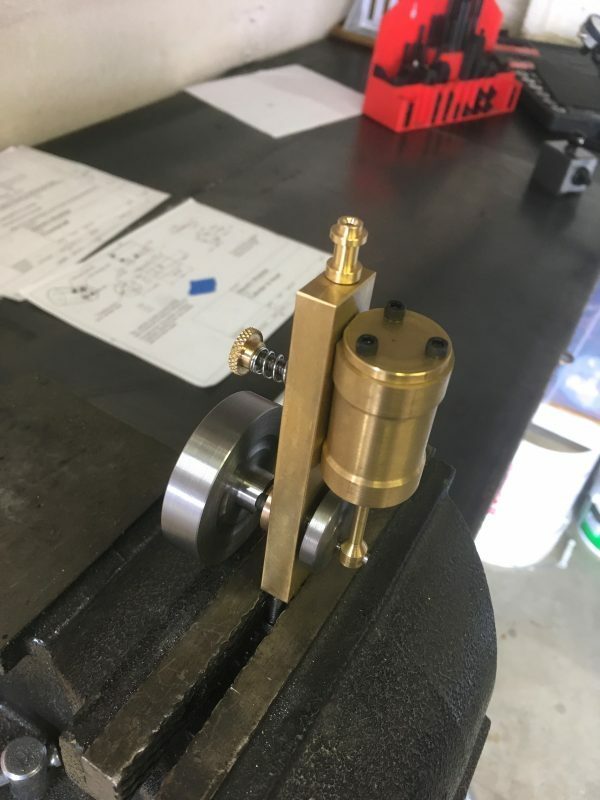 Your quick-change tool post probably came with a knurling tool with the two wheels mounted rigidly to a shaft that goes in the tool post. This is called a “bump knurler”. The first and most critical step in using one of these is to throw it in the trash and go buy a “scissor” style knurling tool. 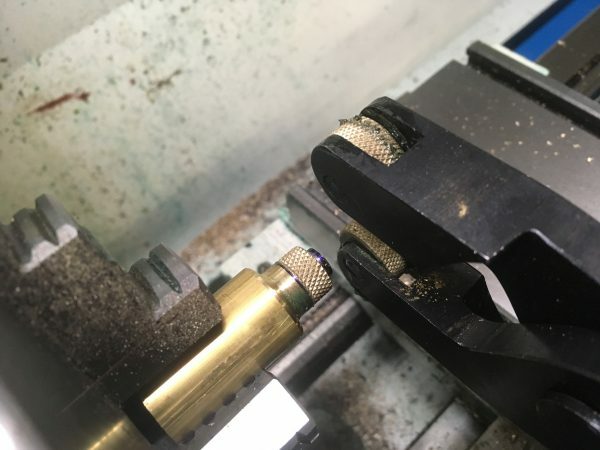 Because knurling is a high-pressure forming operation, you want the pressure to be balanced on both sides of the stock. Bump-knurlers apply all the pressure on one side, which is very bad for the bearings in your lathe. Don’t use them. 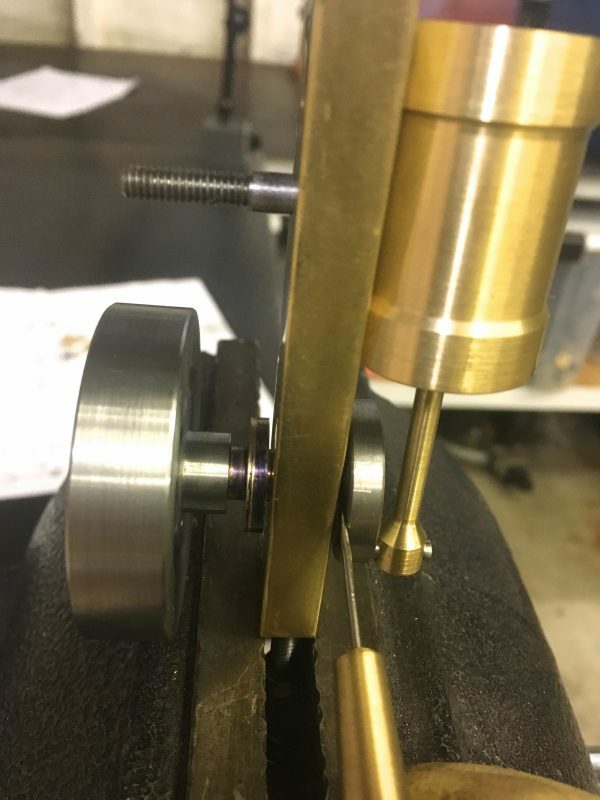 Setup matters a lot for knurling. 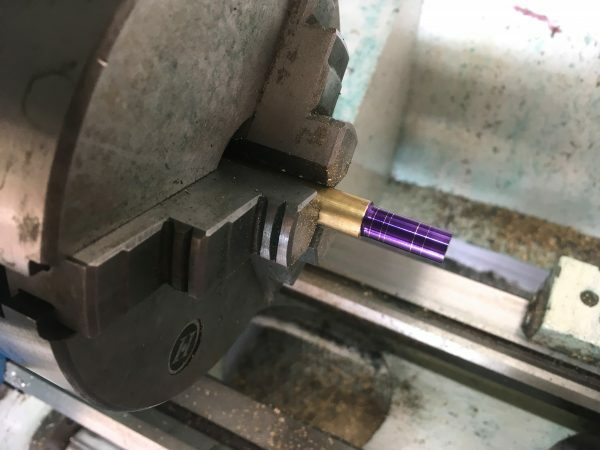 You need to work close to the chuck and align things so that the clamping pressure is centered on the stock. Lock everything down on the carriage. Use lots and lots of cutting fluid. Here’s a pretty decent knurl, following the guidelines outlined above. I’m not great at it, but practice practice practice. 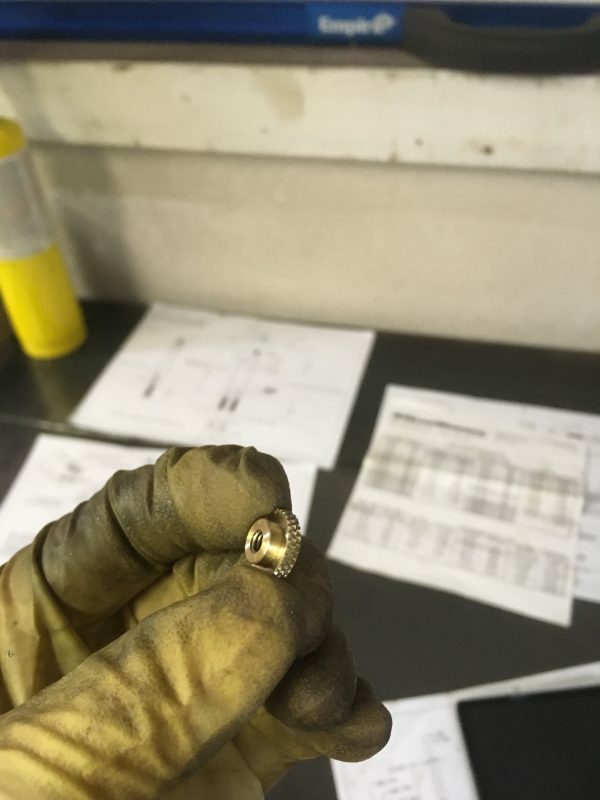 After parting off, we have our nice little tensioning nut. The final (yes, final!) piece we need to make is a fitting to attach our air compressor to the steam inlet. We’re going to run this engine on compressed air, so we need a way to get the air in there. To the drawings! The “steam” fitting is a surprisingly complex little part, but this complexity makes it easy to use, and also modular. 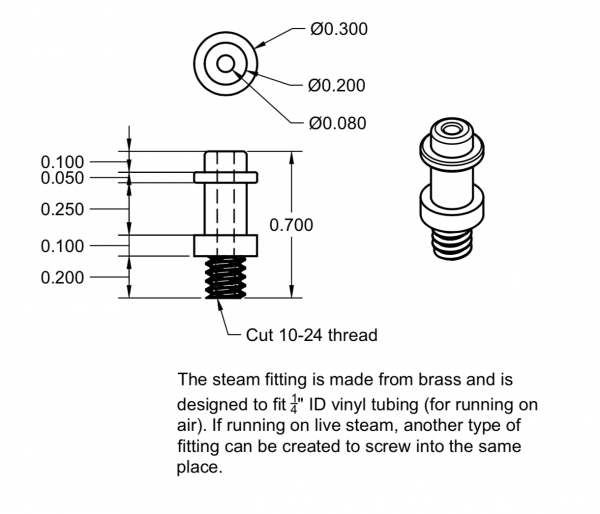 As indicated above, you can easily replace this with another type of fitting for running on real steam. As usual, we start with a piece of stock of generous length, and face the end. Next, we turn down to the largest diameter on the part, and mark out all the features. This part has a lot of narrow ring-shaped features with sharp transitions. Making features this small can be tricky, but a cut-off tool is your friend here. A series of plunge cuts are made with the cut-off tool, measuring the depth with the cross-slide dial. Stop a few thousandths short of the desired final diameter on the inner surface. The final pass is a normal turning operation, but using the cut-off tool. 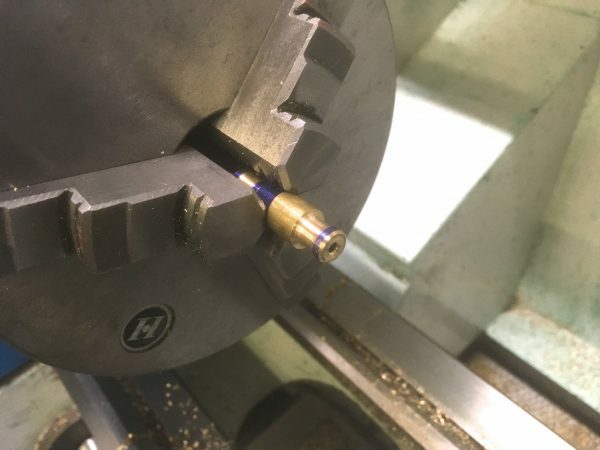 Normally you would never apply sideways cutting pressure to a parting tool, but we’re only removing a couple thousandths here, so it’s fine. We’re left with a smooth perfectly dimensioned diameter in the center section, with nice square edges on either side. 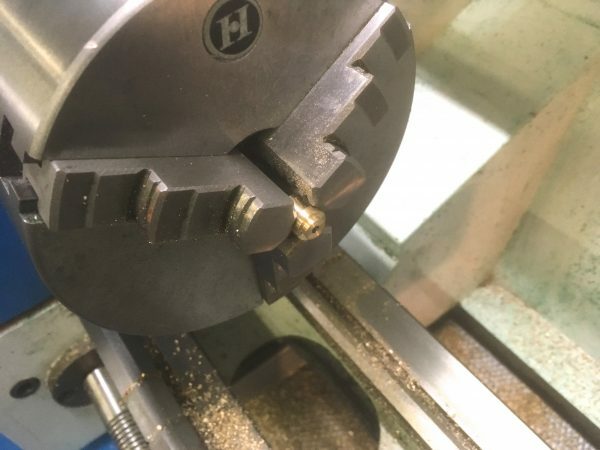 After turning all the diameters using the parting-tool trick, we drill the center, deep enough to go through the final part. Lastly, we thread the end, as shown in the drawings, and part off the other end. 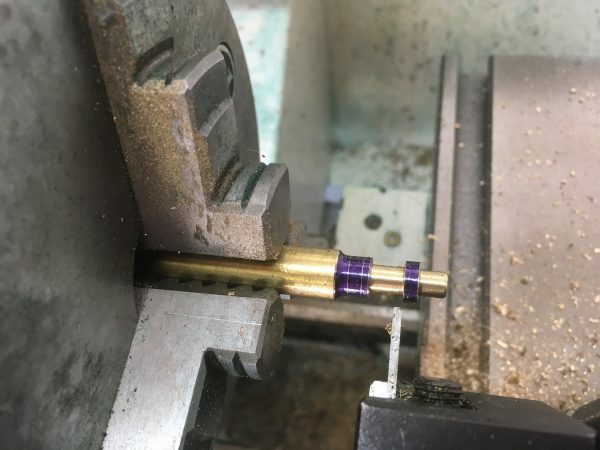 The other end will only have a parting tool finish on it, but it’s not really practical to put it back in the lathe as-is. We tidy up this end by hand. 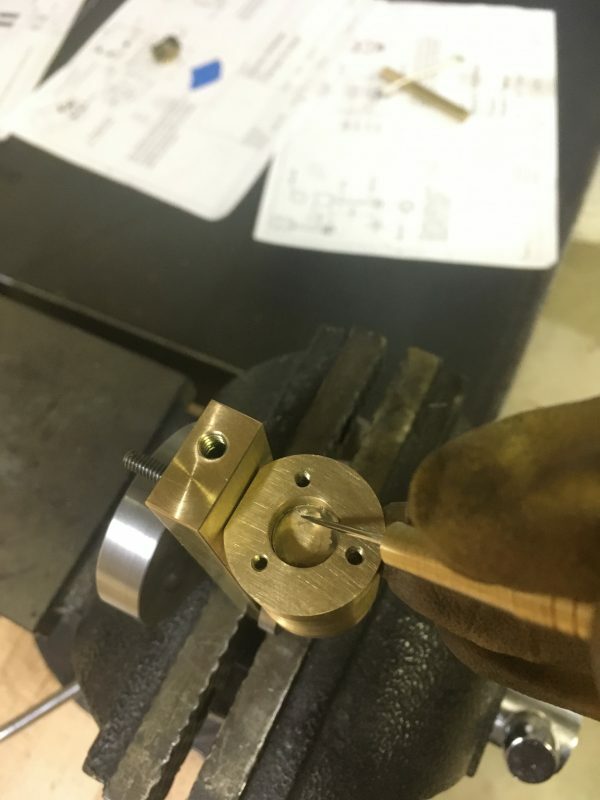 I used a 45° counterboring tool to make a nice smooth transition into the hole for the airflow. Okay, let’s do some fit-up! Even if you make all these parts perfectly, there’s still going to be some tweaking required. Let’s put it all together and check for binding. We start by bolting the main bearing into the frame. So far so easy. As you assemble, apply a little bit of 3-in-1 machine oil to any surfaces that move against other surfaces. Next, the crankshaft goes in. Note that I’ve put bolts in the mounting holes in the bottom of the frame, and I’m holding those bolts in the vice. This is a handy way to hold it while we work on it, without marring any surfaces. The flywheel goes on the crankshaft. We want some end-play here. Just enough that you can feel the assembly sliding back and forth in the bearing.. The cylinder assembly goes on as one piece. Don’t forget to oil everything! Now we can do our fit-up. The whole assembly should spin freely a couple of times if you give the flywheel a twirl. The cylinder head is not installed, thus we have no compression, so there should be nothing impeding movement. Odds are something is binding though, because physics is hard and the real world laughs at 3D models. It can be difficult to figure what is binding though, because we have a lot of moving parts here. 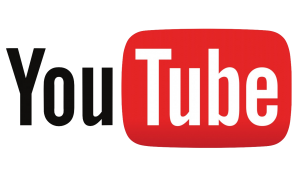 Let’s look at all the places you should check. Much like debugging software or electronics, you want to test moving part relationships in isolation first. Make sure the piston moves smoothly in the cylinder by itself, to eliminate that variable, for example. First and foremost, check for binding of the piston in the cylinder. This is the most likely source of trouble. If the piston binds, take some emery paper to it until it doesn’t. The cylinder’s sealing surface against the frame is also a likely culprit. Make sure you oiled this, and check for burrs on the valve ports. Binding here can also be caused by the pivot rod not being perfectly square to the cylinder face. 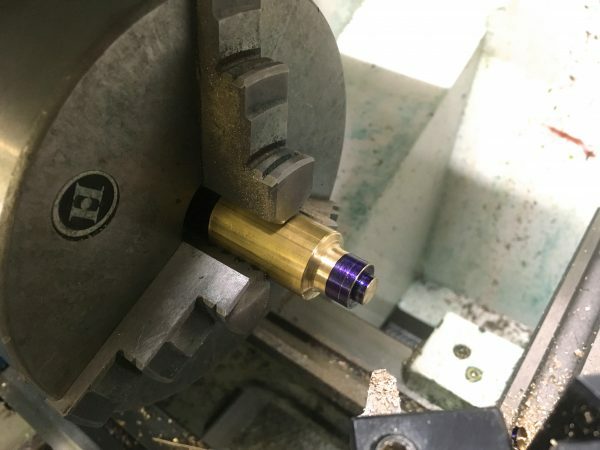 You can “cheat” this by loosing that rod a little bit in the cylinder. The spring will still hold everything together. The flywheel may bind against the end of the main bearing. Oil this, and increase end-play if needed. 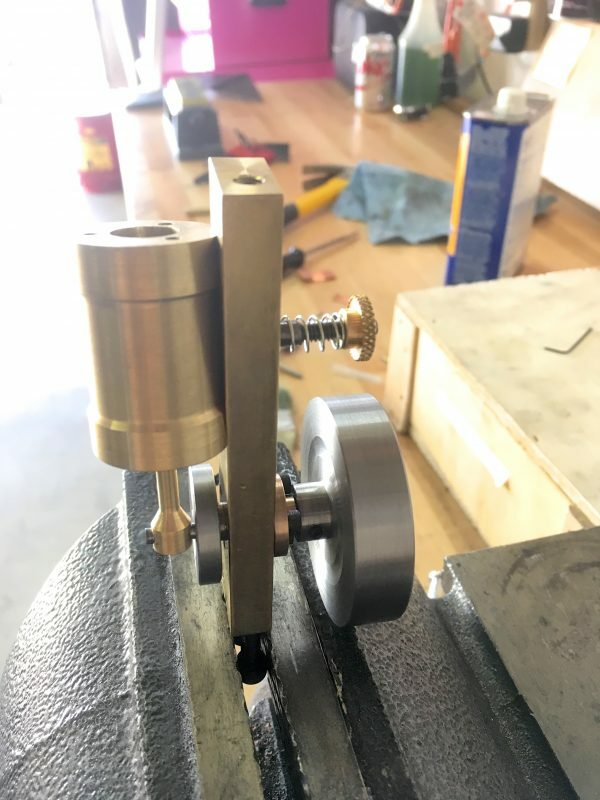 The crank may bind against the other end of the bearing. Again, oil and end-play are your friends here. 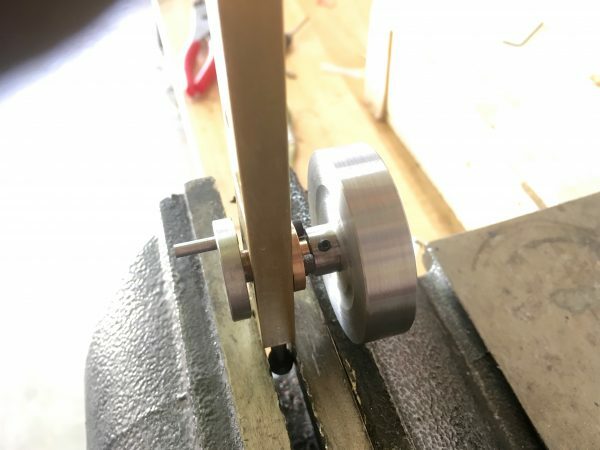 The crank pin may bind in the connecting rod. 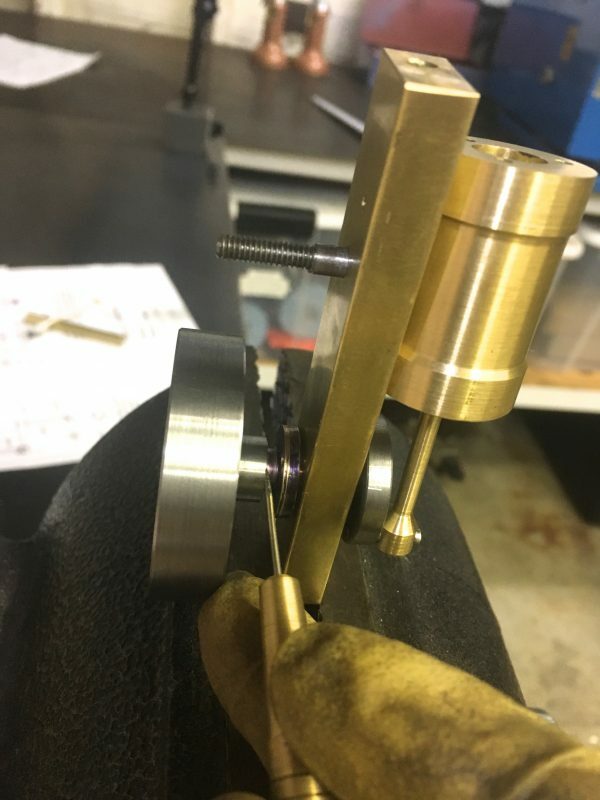 If oil isn’t enough, you can open up the rod hole by one or two thousandths. 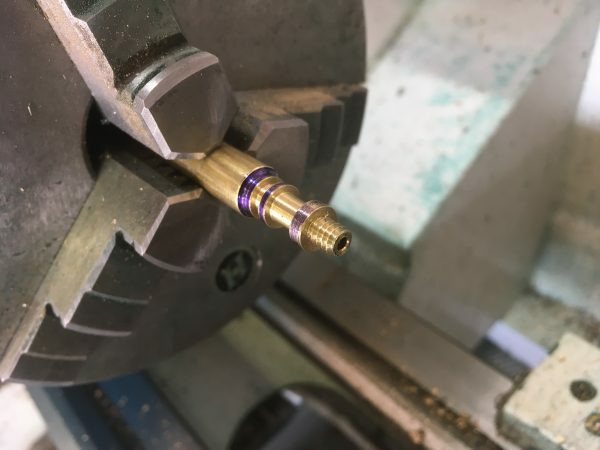 This may be necessary if the crank pin isn’t exactly square to the crank face, or the connecting rod isn’t traveling exactly parallel to the crank face. The latter could be caused by the cylinder face not being exactly parallel to the cylinder bore, for example. Once everything is running smoothly, we can install the cylinder head. With the head installed, and the pivot spring adjusted moderately snug, you should now feel some compression when the flywheel is turned. You can hear and feel little puffs of air out of the exhaust port. Also, if you put your finger over the steam inlet, the engine should get a little harder to turn. If you achieve all this, the engine will run! We’re almost ready to run this little guy! We need a system to deliver air at an appropriate pressure. Garage air compressors generally don’t go much lower than 20-30 psi, but we only need 5-10 here. 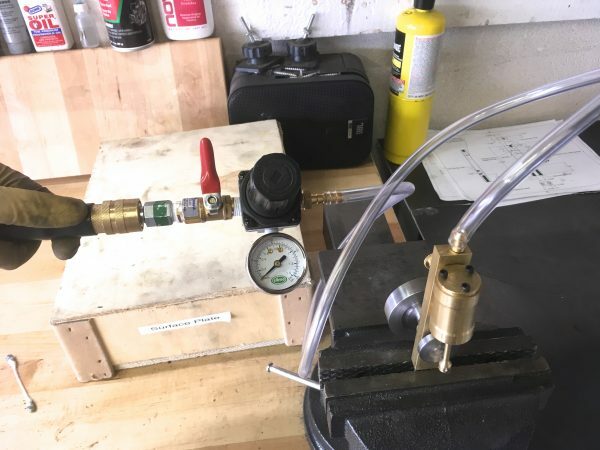 A low-pressure regulator and gauge are needed. The regulator is easy to find, but a low-pressure gauge is trickier. I’m using a tire-pressure gauge intended for garden tractors and other small soft-tired things. I found it at an auto parts store. A few adapters from the hardware store to fit everything together, and a valve to control the action, and we’re ready to go. Huzzah! It may need a little spin to get going, since this isn’t a self-starting engine design. If it won’t run, make sure you’re spinning it in the correct direction, and when in doubt turn up the pressure. Many small flaws in the craftsmanship can be compensated for with more pressure. As the engine runs-in, it will get more efficient and require less pressure as well. Ideally, an engine like this shouldn’t need more than about 5psi, but if it runs on 10psi, that’s nothing to be ashamed of. Speaking of shame, a final exercise that I thought would be fun is to compare this engine to the first version of it that I made. I feel like I made more mistakes on the second one, but I honestly don’t know which will run better. In order to be all sciencey about it, I went back to the lathe and whipped up a little tee pipe for my air system. I want to supply the same pressure to both engines and compare how they run in real time. 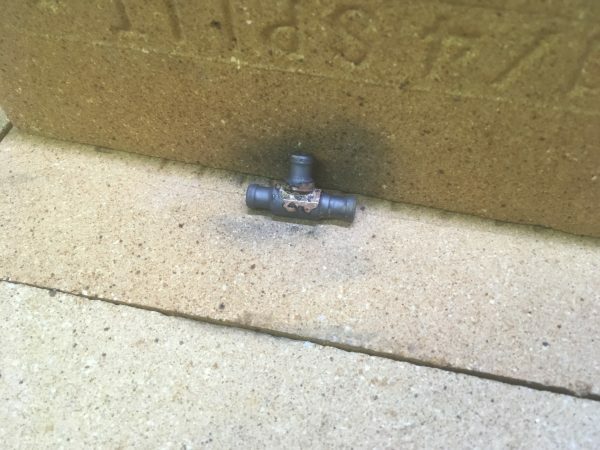 I formed my usual little hose barb on both ends of a piece of scrap, and drilled it through. The inner diameter is a bit larger, since this fitting needs to supply two engines. For the “tee” part, I made another identical fitting, but with a little step on the back. The earlier piece was cross-drilled for the air passage, and then counterbored to accept this little step. Then it was over to the fire bricks to silver-solder the two pieces together. It looks a mess now, but 30 minutes in the pickling bath will clean it up. Don’t get me wrong- I’m terrible at silver-soldering, and no amount of pickling can fix that. This piece will be functional, but it definitely ain’t gonna be no looker. The final step in making a fitting like that is an optional one. 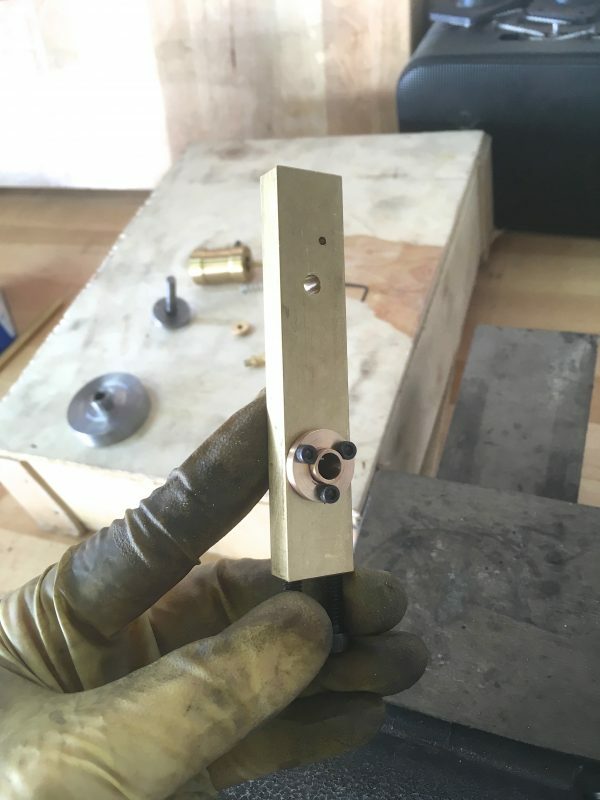 After the silver-soldering is done, you then need to run the drill through it again to clear all the clumsy excess solder you used that plugged the passage. 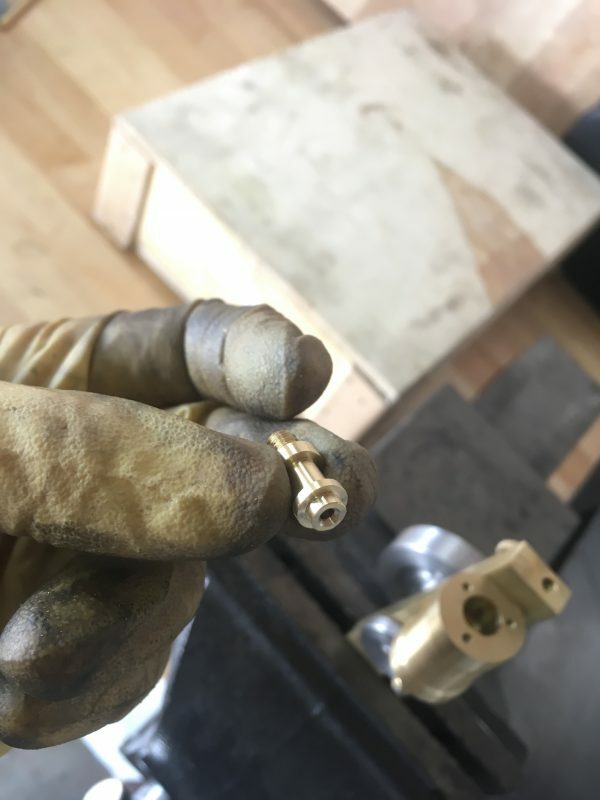 Then, break the drill bit in the process, and then also break a larger drill bit that you use to try and free the broken chunk of the first one. 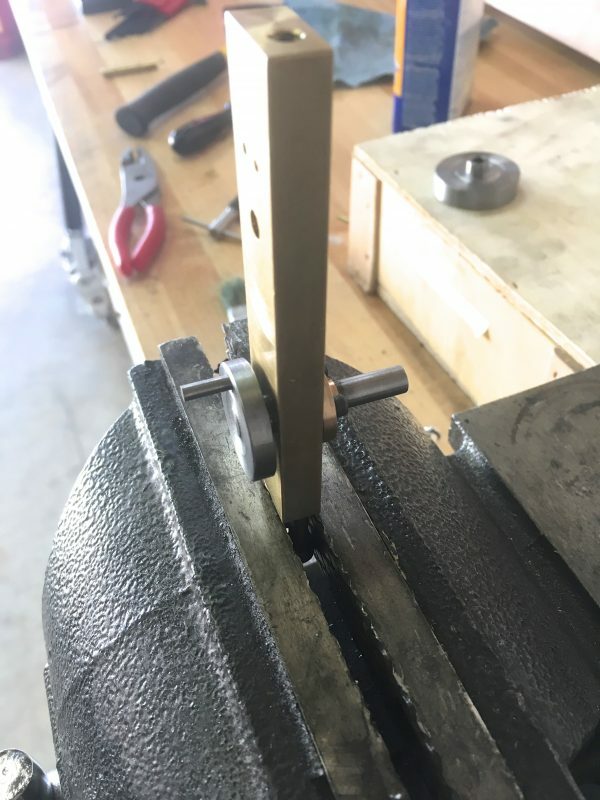 Now that you have two pieces of hardened tool steel blocking the passages in the tee, the part is thoroughly ruined and you can finish up by making the whole thing a second time. Again, I must stress those final steps are all optional. I opted to do them, but you should do what works best for you. Okay, now that we can supply equal parts of Science Air™ to both engines, it’s moment of truth time. Let’s fire ’em up! The results are quite interesting indeed! The newer engine (with the black flywheel) starts a whole lot easier. However, the older engine runs on much lower pressure. As I turn down the pressure, the new engine dies at about 7 psi, despite my attempts to give it a second chance. The older engine, amazingly, happily puffs away all the way down to 3 psi. The reason for the difference doesn’t show on video, but is clear in person- the piston fitment on the new engine is looser. You can feel leakage around it, which you cannot on the older engine. I got a better fit the first time around, despite having zero experience at the time. It just goes to show that learning is a non-linear process. The looser fitting engine starts much easier, because it has less resistance, but requires more pressure to run because it’s sealing poorly. Well, that wraps up this engine project. We have more steam related things in the pipeline, as well as more electronics and other classic Blondihacks-style stuff coming. Don’t touch that dial! Thanks as always to my Patreon patrons, who make this blog possible. Nice work! …and, as always, your sense of humor is spot-on. Especially at the end there — when you described what you did to that poor Tee fitting, I did indeed literally laugh out loud. That’s an interesting question! I suspect the answer is “no”. The flywheel transfers power from one part of the cycle to another. However, the leaking piston is costing power at the source. The flywheel is making loans from a crappy bank account. The lighter flywheel probably does contribute to the much easier starting of the leaky engine, though! Less inertia to overcome. Oh gosh, that is an exceptionally clever design. I’ve never seen that before. Thanks for sharing! I may just have to build that one day. Remember those “Air Hogs” plane and helicopter toys from the late 90s? the ones with a compressed air motor in ’em? Oh cool! I didn’t know that’s how Air Hogs worked. I will definitely be building an engine around this mechanism. It’s too clever not to. There seems to be an interesting tradeoff though- the higher the pressure, the harder it is to open the intake valve, and thus the less efficient the engine gets. There’s probably a moderate-pressure sweet spot. I don’t wonder if a spring somewhere in that valve would counteract the pressure problem… but I’m nowhere near as mechanically inclined as you are, so that may be a red herring.